The latest correction in global equities, including in India, can be attributed to two factors: Poor growth in corporate earnings and a steady rise in bond yields or interest rates in the world’s major financial markets, especially the US. Analysts say while poor corporate earnings made it tough to justify rich valuations on the street, the rise in rates lowered the relative attractiveness of equities over less risky assets such as fixed income and fixed deposits in banks. “The latest correction has nothing to do with economic conditions but it is largely a reaction to the massive build-up of market capitalisation in the past three years without a commensurate rise in corporate earnings. "This correction became imminent as a sudden spike in bond yields in the US raised the risk-reward ratio for equities,” says G Chokkalingam founder and managing director, Equinomics Research & Advisory Services. For example, in India the gains to equity investors in the past three years came from expansion in stocks’ price to earnings (P/E) multiples rather than earnings growth. The benchmark BSE Sensex 30 companies’ underlying earnings per share are down 3 per cent (on a cumulative basis) since January 2015, against a 25 per cent rise in the index value during the period. The index is trading at 24.5x its underlying trailing 12-months earnings, up from 19x at the beginning of January 2015. In the US, expansion in P/E multiples accounted for 70 per cent of the gains that equity investors made since January 2015. The benchmark Dow Jones is currently valued at 20.5 times its trailing 12-months earnings, up from 16x at the beginning of 2015. Analysts say poor earnings growth is not a concern as long as interest rates (or bond yields) are low, justifying continued investment in equities. The sudden weakness in equity markets can be traced to the unexpectedly strong labour markets in the US with higher than estimated hiring by the private sector and a steady rise in salaries and wages. For example, at 2.8 per cent year-on-year rise, wage growth in the US during 2017 was the highest in nearly a decade. A tight labour market could translate into higher retail inflation and faster than anticipated rate hikes by the Federal Reserve. 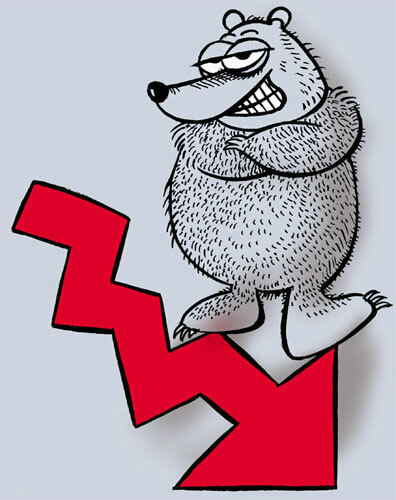 This spooked investors, leading to a sell-off,” said Dhananjay Sinha, head, research, Emkay Global Financial Services. After the labour market report for January 2018, many analysts expect four rate hikes by the US central bank in 2018 against three planned earlier. This could push up the interest rates globally. Already, bond yields in India are up nearly 150 basis points from the post-demonetisation lows in 2016 (one basis point is one-hundredth of 1 per cent). The bond market has reacted accordingly and at one point, yields on 10-year US government bonds had reached 2.9 per cent, up from 2.4 per cent at the beginning of December 2017. The yields in the US are now down to 2.72 per cent. Historically there is an inverse relationship between bond yields and equity prices and the current rally in global equities had been preceded by a period of record low yields in 2012 and early 2013. This opened up a big gap between corporate earnings yields and risk-free rates of return (bond yields). For example, in the last quarter of 2012, the earnings yield for Dow Jones Industrial Average Index (DJIA) companies was 600 basis points higher (average) than the yield on 10-year bonds against a 15-year average spread of 280 basis points. The Indian markets were equally attractive for foreign investors, with Sensex companies offering 400 basis points higher earnings yields than US bonds yields in 2013. The earnings yield is calculated by dividing a company’s latest trailing 12-month (TTM) net profits by its market capitalisation and shows the potential yield for an investor if the company distributes its annual profit as equity dividend. It’s a measure of the relative attractiveness of equity against other yield-generating assets such as bonds, bank fixed deposits, and real estate. The tide has now turned. For example, the spread of Dow companies' earnings yields over the US bond yield is now down to 202 basis points, lower than the historical average of 280 basis points. In India, the earnings yield for index companies is lower than the 10-year bond yield by 350 basis points against the historical average spread of 210 basis points. Not surprisingly, analysts expect more correction in the coming weeks especially in mid- and small-caps, in which earnings yields are 70-80 per cent lower than those in index companies. “Unless corporate earnings start growing faster than the rise in bond yields, the equity markets may remain weak till a new equilibrium is established between earnings yields and bond yield,” Sinha said.